The cell phone industry will remain a competitive market and will increase continuously with a total of 1,200 wireless companies with total annual revenue of $100 billion. The profitability of individual companies is driven mainly by their ability to develop new products, providing better service, making their products affordable for consumers. Profitability of companies is achieved also by taking advantage of marketing their products, have access to capital, and by inquiring the expertise to improve the cell phones. The profitability of the cell phone industry is dependent on the volume of consumer they can attract. The profitability of companies has increased drastically since 2002 and will continue to increase as new cell phones are improved. Since 2004, the financial markets of cell phone companies seem to increase fast because of the new technologies and services that companies are offering consumers, and at the same time they compete for customers. Although there are complaints and dissatisfaction from consumers, cell phone and the service along with it has become a necessity which companies use as an advantage by charging consumers higher price. As in any industry, there are declining and inclining profits. The cell phone has experienced a slight decline; worldwide shipments of cell phones rose 26 percent in the first quarter of 2006 compared with the same period last year. Currently today, the global market continues to thrive on consumers replacing older phones with new purchases, a total of 226.7 million mobile phones. For individual company profitability, Nokia is listed at the top, retaining a third of the global market share and enjoying a 39.6 percent growth. Motorola also had a high increase of 60.6 gains and is controlling 20.3 percent of the market. Samsung has shipped over 29 million phones and is in third place with a decrease in sale to only 18.4 percent growth. LG came fourth for market share with 6.9 percent and experienced an operating loss for the quarter due to marketing expenses and fewer sales. The cell phone industry looks strong and competitive between the companies and service they provide. Even more as new options are in place, such as, allowing consumers to keep their numbers while switching carriers. When compared to the general environment, the industry environment often has a direct effect on the firm’s strategic actions. Our textbook discusses Porter’s five forces of competition in most industries. However, in analyzing the Cell Phone Industry, not only do we cover the five forces model which includes (1) the threat of new entry, (2) the power of suppliers, (3) the power of buyers, (4) product/service substitutes, and (5) the intensity of rivalry among competitors, we are adding the sixth force of another stakeholder group – the Unions. The cell phone industry is highly concentrated. Following the recent Sprint/Nextel merger, only four firms actually control 80% of the current market. Since start-up costs for a cell phone service provider are extremely high, the threat of new entrants is low. A great sum of money must be invested to attain the economies of scale, and it is difficult to enter the market with existing firms already operating on cost and differentiation strategies. T-Mobile is the first carrier, who has staged an online bidding war, asking six vendors to bid against each other online for a contract to build cell phones for one handset segment. Christian Dupont, director of Texas Instruments Inc. refers reverse e-auctions as “devastating for technology companies.” He comments that this trend hinders operators and handset vendors to build trust and keep companies that thrive on innovation from “bringing value” to the industry. In August 2005, the Florida PIRG Education Fund Report revealed how cell phone early termination fees hurt customers. Their research showed that half of cell phone users would switch carriers if they did not have to pay contract termination penalties. Feeling locked in a cell, most consumers resent the $150 – $240 penalties per phone, should they consider changing to another carrier for lower rate or better service. The report also indicated that $4.6 billion have been paid in the last 3 years due to penalties – that’s $2.5 billion in actual penalties and $2.1 billion in lost services from consumers who either cannot afford the penalty or didn’t think it’s worth paying. This clearly suggests that buyers/consumers have little bargaining power in this end. Operators are upgrading their networks to advanced wireless and other third-generation (3G) services, many new entertainment and communications services are becoming available, including new broadcast-type operations on spectrum formerly occupied by Television channels 52-69. With downlink speeds close to that of wireline DSL, mobile service can now provide music download and streaming video sharing. Services such as MobiTV or Juice Caster are some applications that leverage these new networks. Development in miniaturized hard disks and flash drives to solve the storage space issue are already surfacing, therefore opening the possibility for phones to become portable music libraries and players similar to an iPod. Some cell phones already have GPS positioning. In the future, this may be coupled with accelerometer positioning, to cover underground or indoor positioning. This would lead to maps and help finding group members nearby, or identifying strangers. When coupled with camera phone, the GPS technology may also allow users to take a picture or snap the exact location and angle at which the picture was taken. Sprint and Nextel Communications Inc. together created a leading carrier augmented by a global IP network that offers consumer, business, and government customers’ broadband wireless and integrated communications services. The two companies combined as Sprint Nextel has a combined equity value of about $70 million and serve over 35 million wireless customers on their networks and 5 millions additional customers through affiliates and partnership. The merger covers directly nearly 262 million customers, more of U.S. population than any other carrier. A little earlier, AT&T Inc., formed by SBC Communications’ purchase of AT&T Corp. created the then largest wireless phone company. Cingular Wireless won that distinction in 2005 after its takeover of AT&T Wireless for $41 billion. Mergers lead to concentrated pricing power in the hands of fewer companies. When one phone company owns another phone company, the total savings to the company through the “synergies” are substantial, but the potential for competition is undermined. On April 24, 2006, Walt Disney Co. announced that it has reached a deal with the Hollywood unions that will put the “mobisode” spin-off of the ABC hit series “Lost Video Diaries” back on track. The series will air as mini-episodes on mobile phones, with distribution via Verizon, Disney’s mobile partner, by the year-end. The Screen Actors Guild (SAG), The Directors Guild of America (DGA) and the Writers Guild of America (WGA) all submitted an agreement for establishing a template to ensure compensation of future programming on new digital platforms. The agreement calls for residual payments once the mobisode has been available for over 13 weeks on cell phones. The DGA and WGA members will get a pay residual similar to the TV residual in their main contracts – it works out to the 1.2 % license fee for use on cell phone. As far as actors are concerned, the contract provides an escalating minimum wage that starts at $425 per 8-hour day, dating back from April 1, and increases to $450 in a year. On the day before the expiration, the rate quickly jumps to $759, enabling SAG to bargain further from the higher rate. The contract will expire the same time as SAG’s Television Agreement and Codified Basic Agreement, potentially giving the union more leverage. As DGA president Michael Apted expressed, “This deal marks the first of many to come and illustrates how by working together with producers, we will achieve agreements that are mutually beneficial.” By any measure, the cell phone industry is one huge success story of the digital age; who wouldn’t want a piece of this rich pie? The vertical axis represents the total amount of Net Income earned by each mobile phone maker. The horizontal axis represents the market capital each company has worldwide. 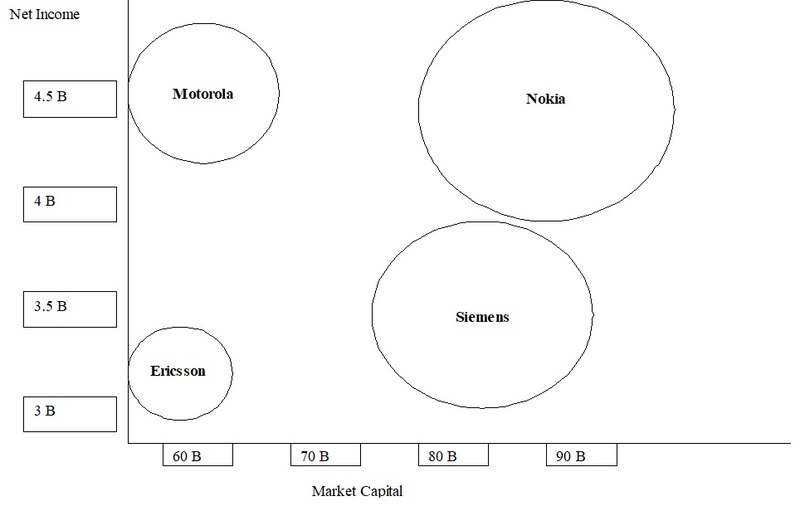 The circles represent the total assets each mobile phone maker has. The figure represents financial position of each company. Among the four major cell phone makers, Nokia has the most market capital and net income, which makes Nokia the largest cell phone maker in the world. Motorola comes into second in net income. Nokia has the best Price/Earning ratio, which means Nokia’s stock has the relative high earning per share. Ericsson has the highest gross margin. Gross margin (gross profit / sales revenue) is a measure of a company’s efficiency in turning raw materials into income. In other words, Ericsson is most efficiency in turning raw materials into income. Nokia, a Finnish cell phone giant, has become the world’s No.1 maker of cell phones, ahead of rivals such as Motorola, Samsung and others. The company’s products are divided primarily between four divisions: mobile phones (wireless voice and data devices for personal and business uses), multimedia (home satellite systems, and mobile gaming devices), networks (wireless switching and transmission equipment used in carrier networks), and enterprise solutions (wireless systems for businesses). Nokia wants to be the leader in third-generation (3G) wireless network equipment. The company has slowly becoming the supplier to half of the world’s commercial 3G networks. By doing so, Nokia swims to the top of the wireless network infrastructure market led by Ericsson. To capture the international market, Nokia rolled out new business and consumer models with color screens worldwide. The company also gained a piece of the Chinese market by delivering a unit of models capable of English and Chinese text recognition to be sold by vendors in China. Motorola is the No. 2 manufacturer of wireless handsets after global leader Nokia. After a previous reorganization, its remaining operations have been focused in four business segments: connected home solutions; government and enterprise mobility solutions; mobile devices; and networks. The company generates nearly 60% of sales through the manufacture and sales of wireless handsets and related products. Ericsson, a company base in Stockholm, Sweden, is the world’s leading maker of wireless telecom infrastructure equipment. Ericsson is also a top cell phone maker and seller through its joint venture with Sony, Sony Ericsson. The company’s other products include corporate networking gear, cable, defense electronics, and software for mobile messaging and commerce. Founded in 1947 as Lucky Goldstar, LG Group consists of more than 30 affiliated companies that operate through more than 300 offices around t he globe. LG Group’s companies operate in more than 120 countries. LG’s annual sales in 2004 have reached $798.8 million (Hoovers). The Group and its former partner, GS Holdings, are headed towards a competitive showdown in the fuel cell and rechargeable battery markets. Samsung Electronics Co., Ltd. is the world’s top maker of dynamic random-access memory (DRAM) and other memory chips, as well as all sorts of electronic gear including LCD panels, DVD players, and cellular phones. The Korean company’s sales in 2004 have reached $ 78,250.1 million (Hoovers), a number that worth a big celebration. The vertical axis represents the total amount of Net Income earned by each wireless service provider. The horizontal axis represents the market capital each company has. 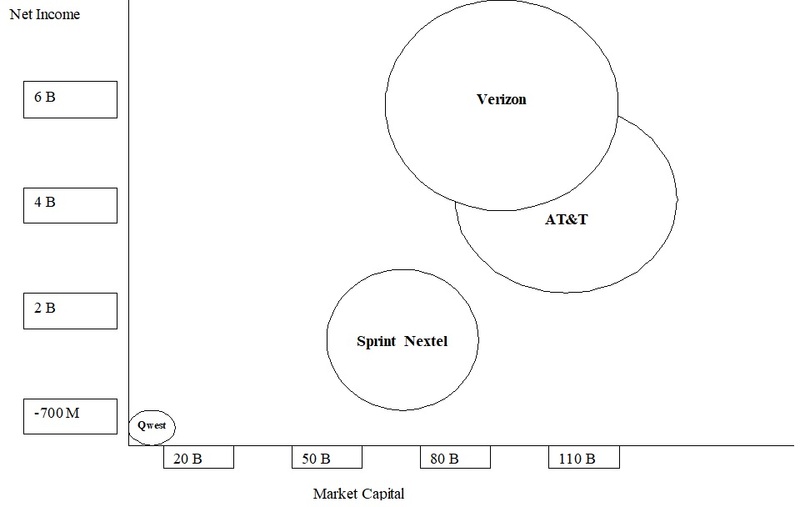 The circles represent the total assets each wireless service provider has. The figure represents financial position of each company. Among the four competitors in wireless service market, Verizon take the lead, which it has the most net income and second most market capital. Whereas AT&T has the most market capital. Sprint Nextel has the best Price/Earning ratio, which means Sprint Nextel’s stock has the relative high earning per share. Verizon has the highest gross margin. Gross margin (gross profit / sales revenue) is a measure of a company’s efficiency in turning raw materials into income. In other words, Verizon is most efficiency in providing its service. Verizon Communications was founded in 2000 when Bell Atlantic bought GTE. The name is a combination of veritas, the Latin word for truth, and horizon. Verizon is a top US telecom services provider base in New York, New York. The company operates nearly 49 million access lines in 28 states and Washington, DC. Verizon operates in four business segments: Domestic Telecom, Domestic Wireless, Information Services, and International. The Domestic Wireless unit offers wireless voice and data services and equipment sales through the US. Its International segment has operations and holdings mostly in the Americas and Europe. Vice Chairman and President Lawrence T. Babbio Jr. The company was founded in 1878 when a dozen customers signed up for the first telephone exchange in St. Louis. SBC acquired AT&T Corp. in 2005 and took that company’s more well-known name as AT&T Inc. AT&T holds a 60% stake in Cingular Wireless, which has acquired AT&T Wireless in a cash deal valued at $41 billion. The deal has created the leading US wireless operator with 46 million customers in 49 states. Chairman and CEO Edward E. (Ed) Whitacre Jr.
Sprint Nextel combines the best of two powerhouse wireless companies. The combination of No.3 US wireless carrier Sprint with No.5 Nextel Communications has created a wireless giant that aspires to take on the wireless units of bounding former Baby Bells Verizon and AT&T Inc. Sprint Nextel has about 50 million subscribers to its nationwide digital wireless network, puts the wireless carrier behind only Cingular and Verizon Wireless in number of subscribers. The company’s wireline business provides local-exchange phone services through more than 7 million access lines in 18 states. There is currently a variety of wireless networking capabilities that are emerging, developing, and integrating. The future of these technologies within the cell phone industry will create better, higher-speed, and longer-distance capabilities. There are two basic and current wireless systems that are already in place. One is Wi-Fi, a local wireless internet access point was limited to buildings, business and college campuses. Wi-Fi is capable of being used within the cell phone industry when the optimal technologies are created. The other is Worldwide Interoperability for Microwave Access (WiMAX), is allowing you wireless access wherever you go. There are currently three providers for the digital wireless mobile phones service that create the networks via satellite. Global Service for Mobile Communications (GSM) has internationally appeal but is the network that Cingular and T-Mobile use for their service. Code Division Multiple Access (CDMA), have better coverage in the United States and are mainly utilized by Sprint and Verizon Wireless. Integrated Digital Enhanced Network (iDEN) is only used by one carrier, Nextel. The other smaller and regional carriers such as Virgin Mobile, U.S. Cellular, MetroPCS, and Alltel use CDMA. The newest trends plan to integrate their technologies in the cell phone industry. Voice over Internet Protocol (VoIP) allows you to make telephone calls using a computer network, or a data network like the Internet. VoIP converts the voice signal from your telephone into a digital signal that travels over the internet then converts it back at the other end so you can speak to anyone with a regular phone number. This new network may also allow you to make a call directly from a computer using a conventional telephone or even a microphone. Ultra-Wideband (UWB) also work with the PC or laptop and offers a cost effective, easy way for consumers to wirelessly transfer data, images or audio from their phone to another source, such as the laptop. Global Positioning System (GPS), this service is already equipped in most motor vehicles, and will soon be a feature provided by cell phone service providers enabling users to find the their own location, or access a mapping service. Although the system currently uses satellites, it is preparing to use existing TV antennas to send out signals. This service is set to hit the market by June through Disney, so parents can electronically locate their children. With all these emerging and current wireless systems in place, the wireless phone companies are panicking in preparation for a major shift in the cell phone industry. They are worried their customers may start using VoIP services like Skype, as Wi-Fi-enabled phones become more common and are lining up behind Unlicensed Mobile Access (UMA). UMA would allow calls to move seamlessly from the GSM cellular network to Wi-Fi networks. Most important to the cell companies, it would let the operators retain control over the call and charge the customer for the minutes used. But, with Skype and some other VoIP services, customers would be able to call for free once their phone is connected to a Wi-Fi network. Some U.S. cities are now proposing free citywide Wi-Fi services, which could mean billions in lost revenue for the cell phone industry. Cell phones will become much more powerful, and designs will continue to morph into ever more complex, multi-purpose personal communication devices, including the growing use of the cell phone as a financial transaction device (see Mobile Commerce below). Batteries for wireless devices will begin to last much longer as well. AT&T and Cingular merged in 2004 and recently the merge of Nextel with Sprint also created a larger company. Mergers negatively impact customer attitudes and perceptions with their wireless service in the short term, creating a sense of confusion and uncertainty. Nextel and Sprint actually experienced the largest 2005 declines compared to their overall satisfaction index ratings in 2004, most likely due to the adverse affects of the merge. Yet carriers not involved in mergers also experienced some decline in overall satisfaction, with the gap between customer expectations and actual service experience widening. Evidence of this can be seen in the 5% increase of intent to switch carriers in the coming year, which was a reverse trend from the past two years, where future switching intent was stable. Although cell phone markets are relatively mature in the U.S. and in major developed nations everywhere, the number of subscribers nonetheless continues to grow in these countries. In the U.S., new subscribers tend to be those on lower-cost plans and children. Already, 40% of 12- to 14-year-old Americans carry cell phones; the rest of them will be soon to follow. Meanwhile, $1 billion cell phone subscribers are expected to join the craze within less developed nations worldwide. The largest nations include Sweden, the U.K, and the Netherlands followed by China and India. Mobile Commerce, also known as mCommerce, will emerge and create mobile subscriptions and advertising opportunities for companies ready to embrace mobile subscribers. Consumers in nations such as Japan and South Korea have already shown that they are more than willing to access quality mobile content and next generation services on a subscription basis, including news, wireless TV, animation and filmed entertainment scripted and adapted for the small mobile screen. The cell phone can is also going to be considered a “digital wallet.” In Europe and Asia, many people pay at the register by reaching for their cell phone instead of their wallets. The phones facilitate transactions between the point of sale and the user’s credit, bank, or cellular account. Phones from Motorola and Nokia plan to implement the system over the next year. Services will come via partnerships between local banks partnering with a service provider. There is always the potential for a newcomer to join the crowd to threaten the current providers by combining the most current technologies, with faster service, and lower prices. Pre-paid phones could become more prevalent with the right service provider that can cater to the “pay-as-you-go” customers. The collaboration of Wi-Fi with the potential spread of longer-range WiMAX, and the eager adoption of VoIP will threaten to turn the cell phone and landline industries upside down. These features are assumed to be included and expected in a basic cell phone package to satisfy the simplest customers. 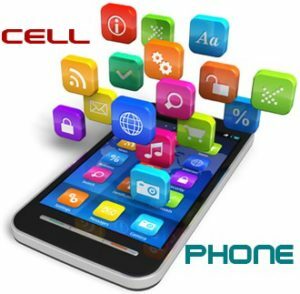 These features go beyond the basics and provide the technical features to attract the savviest of cell phone subscribers. Internet capabilities to receive billing, make payments, and download ringtones. Detailed Billing either in paper form or downloadable from the internet. High-Resolution Camera, most important feature among subscribers. Text Messaging, 3 billion wireless text messages are sent each month. Web Access to get stock quotes, sports scores, weather, and up to the minute news. Insurance to protect yourself in case of malfunction. NO Domestic Long-Distance Charges, not available with landlines. Ability to Download Ringtones, free is better. Battery Power is the second most important feature among subscribers. Bluetooth is wireless technology that communicates with a wireless hands-free headset. Video capability at least 15 seconds of video is the standard. Prepaid Minutes typically useful for an individual that requires minimal talk time. Mp3 Capable, subscribers want to be able to use their iPod’s with their handsets. Ability to Record Music and play it back or use as a ringtone. FM Radio can now be transmitted through a handset. FLASH Memory Cards can hold up to 100 songs and are removable. Every company can provide the basic and technical features but the ultimate test for success or failure is decided by the support the cell phone company can provide to their subscribers. Pricing Plans that provide a reasonable amount of minutes and coordinate with the basic and technical features. A family plan allows the whole family to share their minutes on one plan. Wireless Service Satisfaction, a strong signal reception for a network is a must to provide the subscriber with clear call quality minus the static/interference, voice distortion, echoes, and dropped/disconnected calls. Wireless Customer Care Performance, the customer service is as important as the basic and technical features. Wireless Retail Sales Locations can provide a physical location to get hands on experience with a handset and face-to-face contact with a representative. Wireless Phone Handset Satisfaction can offer multiple options from size, weight, design (folding, swivel, rectangular, or sliding can affect the performance), and antenna. As reported in USA Today, a Federal Communications Commission report stated that over the past four years landline usage has decreased by 30 million users. There are great opportunities right now to get a lower price or a lot more minutes on a cell phone. The cell phone industry is offering unlimited plans in growing numbers. The word cell phone has become a familiar usage across the globe, especially in developed countries. The Cell Phone Service Providers have made provisions to allow users to access the Internet through the cell phone, without taking the pain to log into their computers. Cell Phones now can be used as planner, navigation system and for games. Also, Steve Jobs the owner of Apple has enabled the innovative invention of the Motorola hybrid phone, which has an iPod with the cell phone. The cell phone is one technology where people of different ages can use without any hesitation. Cell phones are also used as fashion objects, since the styles have been changing almost every year; for example, the credit card-size ‘Samsung SGH-P300’ or ‘Motorola Black RAZR’. Also, now various ring tones of one’s choice can be downloaded to the cell phone. And there is the camera phone, where a camera is attached to the cell phone, and the pictures taken with a camera phone are of good quality that can be e-mailed or even printed. The cell phone technology has infiltrated its way through the teenage population very fast. The national network, Sprint is on the verge to launch cell phones that are custom handsets, which contains phone contents such as Disney ring tones and games. This is a way where the cell phone industry can open a whole new arena for attracting a market for children. Also, there is the new culture of SMS (Short Message Service), which is a new way to send text messages. SMS is quite popular among teenagers and college students, which helps everybody to keep in touch with friends and family. Nowadays all cell phone manufactured supports SMS. In fact, the use of Internet supports the option for instant messaging, such as with America Online’s Instant Messenger. Mergers might be good for the cell phone service providers, however, if the nation’s leading cell phone companies merge, there will be less competition in the market, causing prices to increase than before. With large mergers like Cingular and AT&T, there is the risk of a monopoly in the market, which can charge the highest possible prices to consumers. This will definitely pose a threat to consumers, because the number of options of choosing one cell phone service provider over another is reduced. As with new technology, health concerns have risen with the use of cell phones. There are certain studies that show a few cases of tumors or cancer that develops as result of using cell phone for long periods of time. According to the Food and Drug Administration, these health problems are said to be caused due to the radiations emitted from cell phones. Also, these radiations tend to cause birth defects due to genetic mutation. In addition, many incidents of road hazards occur because of the use of cell phones. Many accidents involving a driver being distracted by talking on a mobile phone have begun to be prosecuted as negligence similar to driving while intoxicated. In US, many of the state legislatures, about 40, have passed laws to ban the usage of cell phones while driving. Cell phones have also been a major threat to security. There have been cases of identity theft, and also where a third party can intercept in a network listen to conversations. Also the bombings that occurred in 2004 at Madrid, was from a cell phone. So there are major security concerns of the cell phone that has to be looked into. Now almost every individual thrives to own a cell, especially in developed countries. For instance, according to “industry statistics (CTIA, The Wireless Association) reveal that the number of cellular subscribers in the U.S. now total nearly 195 Million” (Goodstadt). 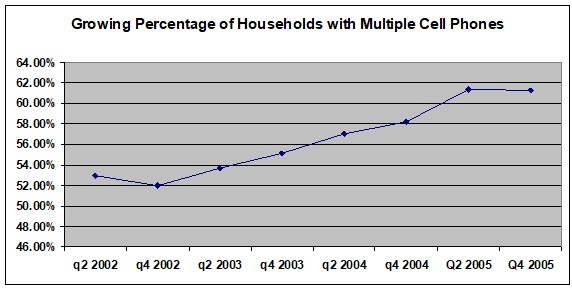 Below is a graphical presentation of a sample of households that are cell phone users in US. According to reuters.com, “December 2005, the global cellular market had 2.14 billion cellular subscribers, up from 2 billion in September 2005. Experts predict 3 billion subscribers before the end of 2008.” Now cell phone manufacturers are making phones that are capable of accessing VoIP (Voice Over IP), which is now a way to make phone calls free of charge, such as with what exists now Skype and Vonage. Analysts predict that this new development will help the cell phone industry profits rise, because of the newer technology; and nowadays consumers are waiting to acquire the newest technology that can help them to be more efficient. In recent years, cell phones have turned out to be a necessity rather than a status symbol. Nowadays, cell phone manufacturers are producing different phones that fit different needs; and also, service providers have different plans for customers to choose from. With the advance in technology, consumers are able to experience the ease in communication. From 1994 onwards, the cell phone industry has seen great success through the years, and analysts predict that this growth is only going to increase with the advancement of technology.